MG Plate Rolls & Plate Rolling Machines for Sale | C Marshall Fabrication Machinery, Inc.
Having the same features as the M line, the the 3 rolls are built with three powered rolls. Planetary movements: bending roll planetary movement that reduces frictions to a minimum. Friction is very common on traditional movement machines, such as diagonal or horizontal sliding guides. Direct drive through planetary gearboxes: Planetary drive eliminates complicated transmission systems which are not energy efficient. They are directly coupled on the rolls, bearings and hydraulic motors. This way all machine strength is focused on the material to be bent (positive strength) with consequent energy savings. Permanent lubrication: All machine components are pre-lubricated and sealed following an unique system granting lubrication for life. Double spherical roller bearings for the rolls instead of bushings to eliminate bushing tolerances and friction which results in energy loss. 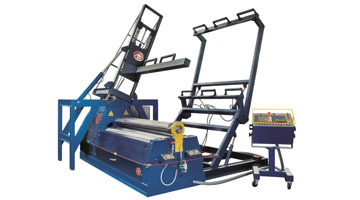 One of the advantages that four-roll machines have over the 3 roll machines is simplicity. 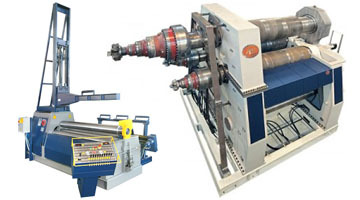 You can also work a 4 roll plate roll with a CNC control which is not possible with the 3 roll plate roll. MG has updated the radial movement of their machines resulting in stronger and more efficient side rolls movements rolling even when the machine works at its capacity limit. Massive torsion bars grant the absolute rolls parallelism. The torsion bars together with all the hydraulic devices generate a system that gives absolutely precision and versatility. MG rates the rolls 3 times the top roll diameter; competition rates them 5 times the top roll diameter. For instance if you have a 10 diameter roll, with MG you can roll down to 11 ID diameter; comptetiton rolls down to 15 ID diameter. Also, MG can roll to 1.1 times the top roll diameter.